My library aims to observe Martin Luther King, Jr. Day each year with multigenerational programming that engages our community on issues from Dr. King's work and themes in his speeches and writing. When it came to planning for MLK Day 2017, the new Civic Lab here at the library felt like a completely natural connection. We wanted to intentionally connect our goals for civic engagement with Dr. King's vision for a truly united country, starting with our library community. And so our 2017 event was created: Together at the Table. 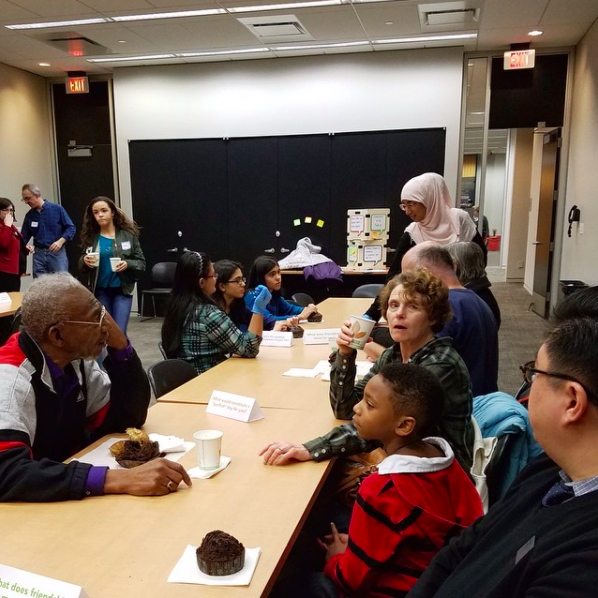 Our Together at the Table program was, at its core, a drop-in community gathering meant to foster feelings of empathy and belonging among all the many people who live in Skokie and who use the library. From noon until 8 p.m. on that Monday, Together at the Table took place in our larger multi-purpose programming space which is adjoined with a kitchen. We pushed together four of our tables, end to end, to create a long banquet-style table with chairs. Spread across the tabletops were tent talkers to get conversations started; we chose 6 questions from "The 36 Questions That Lead to Love." We purchased many dozens of muffins (all kosher) and set out hot coffee, hot water and tea, and ice water as well. And so the stage was set. by adult program librarian Mimosa Shah. Throughout that day, four excellent high school volunteers helped facilitate the program alongside library staff. Those high schoolers greeted patrons at the door--and we indeed saw patrons of every age. After encouraging (and in some cases helping) patrons to make a name tag, the volunteers led them to a seat. New arrivals were seated next to people already in the program, and so the volunteer would make introductions--nobody in the room was a stranger, nobody without someone to talk with. The volunteers would then go to the kitchen to get a muffin for each participant. More often than not, before the volunteer could even come back with the muffin, the patrons were diving into conversations with their tablemates. As I pitched this program to my fellow programming team members and staff, I kept coming back to the central idea that participants would be able to break bread with one another and get to know fellow community members. 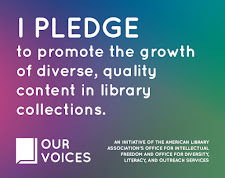 I had the support of supervisors throughout the library that these conversations be open to staff at every level as well--and we did have about two dozen staff drop in to meet and talk with patrons throughout the day. Breaking bread is such a strong human interaction that seems to span all cultures; friendships and family are made over a shared meal. We wanted to facilitate that feeling of goodwill and community in our library--in particular at a moment, and at the beginning of the week of the inauguration, when many in our community were feeling unsettled, isolated, and worried. Was the day successful? To be honest, I would have counted Together at the Table a success if even a single conversation took place in that space. I wanted to foster a space for meaningful interaction--something deeper than a rote "How are you?" / "Fine, and you?" back and forth or a conversation about the weather. And with that modest goal, I was blown away by the interactions that took place and the relationships that were formed. "We discovered that we have friends in common!" A patron who participated without knowing anyone struck up a conversation with someone seated near them, and they discovered that they share mutual friends. They remarked about feeling like the community is a close-knit, interconnected one. A girl scout leader in the program with her troop connected with our deputy director, who leads a troop in a neighboring town. The two groups have made plans to get together. An older elementary boy, who spends many of his out-of-school hours at the library, expressed delight and excitement at not only learning the library director is, in his words, "Korean like me!" but in being able to have a conversation with him as well. Two young men who entered the program separately and were seated next to one another became friends in the course of their conversation, trading numbers before leaving so they could meet up again. One woman responded to the prompt about something she's dreamed of doing with her desire to open a female-friendly auto repair garage. After talking about this dream with her seatmates, one identified himself as a person in real estate and he shared with the woman information on how to find a location for her business. They exchanged numbers and made plans to continue their conversation. A 21-year-old man shared that the day of the program marked his twentieth day since coming to the U.S. from Afghanistan. In the course of his conversations with his tablemates and one of the teen volunteers, he became curious about the library's volunteer opportunities as a way to meet people and improve his English. He ended up talking with our volunteer coordinator, who had come into the room. These are just a handful of the interactions that played out across the shared table. Our community embraced the ethos of Together at the Table wholeheartedly. I was struck by how open-hearted and honest the conversations I had, and the conversations I heard about, were. By how willing our community is to forge bonds with one another. We had several participants ask if we plan to do this sort of program again, and many of us on staff and in our administration want to. If a root of civic engagement is feeling invested in one's community, Together at the Table certainly showed we have strong foundation in Skokie for this work. This sounds so fantastic! I hope you don't mind if I ask: how do you get the public to actually come to a program like this? My system hasn't done anything like this in the past, and we struggle to get attendance for anything beyond storytime. How did you promote it? How did you choose when it should take place to encourage attendance? Thanks in advance! Chelsey, these are great questions. One of the reasons we opted for an 8-hour program window (as opposed to a 2- or 3-hour window like we've done for other Civic Lab appearances) was because we specifically wanted to have the programming lasting long enough to encourage folks who were in the library for another reason on MLK Day to come into the program without imposing too many time restraints on them. So the length of the program (or, rather, the time accessibility) was a big factor in encouraging attendance by folks who hadn't specifically planned to attend. We know that we tend to have a good amount of foot traffic through the library on bank holidays like MLK Day, so we felt reasonably confident that we'd get attendees that way. In terms of promotion, the event was on the cover of our adult program guide, on our website, on our social media accounts, and also on posters at both entrances to the building. That's pretty heavy promotion for one of our events. We also worked closely with staff throughout the week leading up to the program and on program day to personally invite library visitors to participate. A significant portion of our participants were recruited day-of by staff who let them know the program was going on--they might have missed it otherwise. And finally, in our community events that mention there will be food involved tend to draw a bit of an audience just on that fact--so we made sure our publicity messaging included the fact that there would be muffins. Hope that helps!